The craftsmanship of Peterson Real Fyre Designer Series Gas Logs captures the realism, texture and subtle nuances found in nature. These hand painted originals, modeled from real world samples, are sure to add a touch of elegance to any home. Designer Plus series features more natural color and bark details. The ends of the logs and split pieces are a different color than the bark, and they include red feather detail painting, giving the logs the most authentic look. 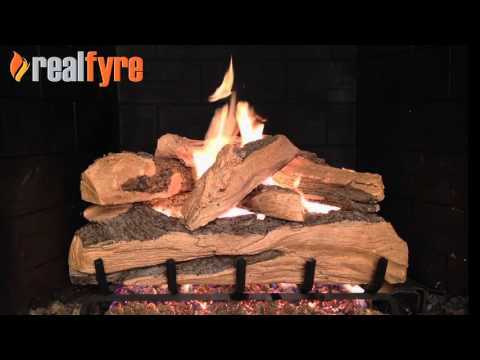 This Peterson Real Fyre gas log set includes: Ceramic Refractory Vented Gas Logs, ANSI Certified Vented Burner with Pre-Assembled Valve and Regulator, Piezo Ignitor, Custom Grate, Connector Kit, Glowing Embers, Vermiculite, Burner Clips, and Damper Clamp. The Peterson Real Fyre Vented ANSI Certified G46 Burner features a T-shaped burner pipe. The T-shaped burner contains a large pipe in the center of the pan and a smaller pipe that runs through the ember bed. This allows the flames to not only dance through the center of your log set, but through the center of the ember bed, which gives you a more realistic flame pattern. This burner also contains a patented system that features a hidden factory installed control valve, and piezo ignition at the rear of the burner. It has a BTU output of 55,000 BTUs. This set features a basic variable flame height safety pilot valve that is operated by a switch or the included remote control. The ANSI Certified G46 Burner is available with all Peterson valve controls with or without remote controls and in multiple size sets.